Useful Information About The Benefits Of Watermelon and its regular intake. Every year we celebrate the Festival Of The Watermelon on the third of August. No wonder this juicy fruit is valued so much around the world. Here are some reasons to increase our daily intake of watermelon due to its numerous benefits for our bodies. Thisgreat fruit deserves to have its day in the calendar.The sweet and tasty watermelon is one of the favorite fruits of summer. Watermelon contains 90% water, thus making it ideal for people who want to keep in good shape.There is a curious fact is that in the U.S. and Mexico we distinguish about 300 varieties of watermelon – red, pink, white or yellow,etc. Watermelon not only quenches thirst in the hot months, but also suppresses inflammation in the body which is an important property for health problems such as asthma, atherosclerosis, diabetes, colon cancer, arthritis. The juicy fruit actually contains some of the most important antioxidants in nature. Watermelon is an excellent source of the vitamins C and A, especially by the concentration of beta-carotene in the fruit. Pink watermelon contains more lycopene. These powerful antioxidants neutralize free radicals (these are substances that can cause major damages to the body). They are able to make cholesterol stickier so it can hold on much easier to blood vessels, which increases the risk of a stroke and a heart attack. Vitamin C and beta-carotene, however, are very good at removing these harmful molecules and preventing the damage that would be caused. A bowl of watermelon provides 24.3% of the daily dose of vitamin C and 11.1% of the quantities of vitamin A. 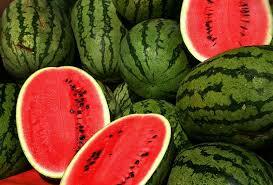 Now it is the season of watermelons and we recommend that you make the most of their beneficial qualities.